Gain new followers and make new friends with the Book Blogger Feature & Follow! If this is your first time here, welcome! You are about to make some new friends and gain new followers -- but you have to know -- the point of this hop is to follow other bloggers also. I follow you, you follow me. 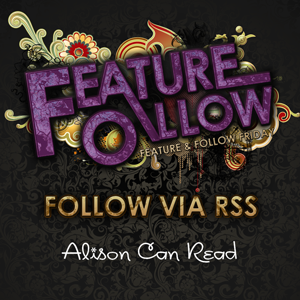 The Feature & Follow is hosted by TWO hosts, Parajunkee of Parajunkee's View and Alison of Alison Can Read. Each host will have their own Feature Blog and this way it'll allow us to show off more new blogs! How does this work? First you leave your name here on this post, (using the linky tools -- keep scrolling!) then you create a post on your own blog that links back to this post (easiest way is to just grab the code under the #FF picture and put it in your post) and then you visit as many blogs as you can and tell them "hi" in their comments (on the post that has the #FF image). You follow them, they follow you. Win. Win. Just make sure to follow back if someone follows you! What sets this Hop apart from others, is our Feature. Each week we will showcase a Featured Blogger, from all different genres and areas. Who is our Feature today? Find out below. Just remember it is required, if you participate, to follow our Features and ayou must follow the hosts (Parajunkee & Alison Can Read) as a courtesy. How do you follow someone? Well, if you have a preference, state it in your #FF post. A lot of blogs are transitioning to Wordpress in which they do not have the luxury of GFC, so an RSS subscription is appreciated or if you choose an email subscription. If you don't have GFC please state in your post how you would like to be followed. How To Become a Featured Blog? We pick our featured blogs randomly each week from the blogs who participated the week before. Please be sure to feature your e-mail address clearly on your blog. Either on the main blog, on a Contact page, or on an About Me page. If I can't find your email easily, I will choose a different blog to feature. March this year. I'm still a bit of a newbie! 2. What is your favorite part of book blogging? Learning about new books and authors and getting to know fellow book bloggers. 3. What type of books do you mainly blog about? Everything YA. I'm a tad obsessed. 4. What are your favorite books? Harry Potter by JK Rowling, The Agency by YS Lee, The Day After Forever by Erin Skiffington, Anna Dressed in Blood by Kendare Blake. I also love all things Maggie Stiefvater (though I STILL haven't read The Raven Cycle, eeek! ), David Levithan, Sarah Dessen and Nicholas Sparks. This year I added a new book to my favourites list, and it is Magonia by Maria Dahvana Headley. So much love for that book! 5. What has been the best thing that has happened to you because of book blogging? Hands down, the best thing has been getting to know and making friends with other book bloggers. Everyone has been so lovely and supportive. As too few of my friends in 'real life' enjoy the same books as me, it's great having people to squee about books with, finally! Question of the Week: Name a book you hated - Suggested by Bookish Findings. I'm trying to remember the last book I hated. Usually I just stop reading a book when I'm not enjoying it. Occasionally I'll flip through books who's political view I disagree with and generally dislike those. I wasn't able to get through Legacy of Kings, which is a book many people have raved about. But I wouldn't say I hated it - more that I haven't loved it yet. With GFC going the way of the dodo bird for many bloggers, there is no better time to start following blogs via RSS feed. If you use a reader, it would be great if you followed my RSS directly. We have a new button, so update your blogs if you are used to doing this meme! If you could have any super power, what would it be? - Suggested by Jess Time to Read. I have an updated CAPTCHA post! If you have CAPTCHA word verification enabled on your blog, please take it off. It makes it much more difficult for readers to comment. Please look at my CAPTCHA Eradication Post to learn how to get rid of it. My husband tries to convince me not to finish reading a book if I am disliking it but I feel like I am learning from those books what not to write about in my own writings. I remember all the buzz over that one too! I found myself hesitant over it to begin with though. I agreed with you too, if I do not like a book I stop reading it and move on to something. Followed you today with Bloglovin. Just added my post MHDeanCollectibles and joined the MEME. Well heckfire, I I set the post to go today...I thought, but apparently I was looking at the calendar wrong, so I got it up late. Thanks for featuring my blog, Alison! :-) I liked Legacy of Kings but I can definitely see why some might not. The huge number of POVs felt a little too much sometimes. Sometimes I do stop reading a book I'm not enjoying, but other times, I read it all the way through, just to find out how it ends. Then I kick myself for having wasted my time like that.....lol. I mentioned two YA novels on my blog, because the blog is dedicated to YA fiction, but there are adult books I have hated. For example, I can state, with no doubt whatsoever, that I HATE "Wutheirng Heights". This novel is not a love story at all, but the story of a psychopath's revenge on the innocent members of a family that did him wrong. He didn't even revenge himself on the guilty parties!